In a curious move, AT&T has raised the subsidized price of its cheapest iPhone to $0.99, up from free. When the iPhone 4S was announced in October, Apple specifically mentioned in its press release that the iPhone 4 and iPhone 3GS would be available in 8GB capacities for subsidized pricing of US$99 and for free, respectively. Our lower price plan continues to be a good entry point for many subscribers and now that we offer a free iPhone with a 2-year contract for the first time ever, the iPhone 3GS, we expect to broaden the smartphone base even more. I also mentioned in my notes that we have another device that I think is going to dramatically change those people that are on smartphones and quick messaging devices, the 3GS, which is free with a 2-year contract. We've seen a tremendous, tremendous demand for that device even though it's a generation old. And actually, we're getting more new subscribers coming on the 3GS on the average than other devices. iPhone 3GS is still available at an incredibly low price and we're confident consumers will agree that this remains one of the best deals for a leading smartphone. 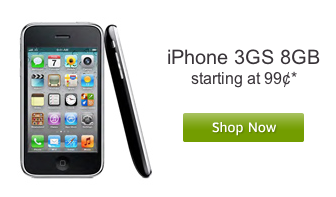 For its part, Apple continues to offer the iPhone 3GS, subsidized on AT&T's network, for $0.00 on the Apple Online Store. Update: MacRumors forum user Metcury46l had one possible explanation for the price change: I work at AT&T, this is being done to help prevent fraud as the 99 cents cannot be billed to your bill. It must be charged to a credit or bank issued debt card. Fraudsters are using stolen identities to steal these handsets ... been an issue since they went free. Isn't is it good for marketing purposes to be able to make the "free" claim? I won't pretend to be a marketing genius or anything but that seems like an odd move. As someone who is in marketing, I'll say this: there's something to be said for never marketing anything as "free". When people see free, they immediately associate the product as having no perceived value. Believe it or not, marketing it as 99 cents gives the phone much more than a 99-cent value simply because it isn't free. Dollar here, dollar there.....sooner or later that turns into real money. Anyone who sits and calculates how much they will pay with their two year contract (thousands of dollars) will realize that 99 cents is no different than free. Anyone who sits and calculates how many THOUSANDS of dollars they will pay over a two year contract, and still decides to get an "old screen" 3G to save $98 bucks, instead of getting the immensely more functional 4 is an absolute idiot. I'm guessing this was just done to avoid some conflict in their software or just make some accounting cleaner. This is an outrage !!!!!!!!! 100% increase is unacceptable !!!!!!!!!!! Math failure is unacceptable !!!!!!!!!!! Wait - AT&T is evil because they charge $.99 for a phone. Sure does. Cell phone carriers are just as rotten as banks. Actually, when I was last in Walmart a couple of weeks or so ago, they had them priced at $1.00 even at the store I was at anyway. I thought that was kind of weird at the time when I saw it.